I like a lot of things about Wolfram's Mathematica software; it is an extremely useful tool for symbolic mathematical manipulations and visualization of various functions. However, it is expensive software so recently I have been exploring if there is a free alternative. In doing this I came across Cantor that can run SageMath as a backend, which in turn is built on top of Maxima and other packages. Right after that I had it display the TeX code for typesetting the equation, which I can reuse to get it displayed below. Next is a five by five matrix of random numbers, from this the eigenvalues (a summary of how the matrix transformation tends to behave when applied to a system) are calculated and in this example two of them happen to be complex numbers (which indicates that the system has a rotational quality in two of its five dimensions). 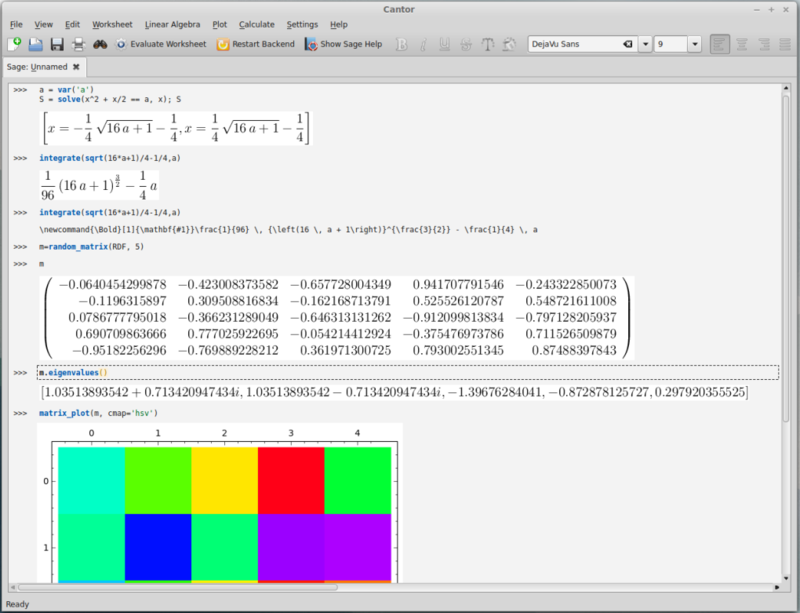 Last there is a plot to visualize the matrix entries but it is cut off at the bottom of the window in this image. I am impressed. It is still not capable of all the tools built into mathematica but I am glad I came across this. This entry was posted in software on March 25, 2015 by Floyd A. Reed.